The Patent Trial and Appeal Board (PTAB) is defended by the Supreme Court (Oil States decision), but will patent extremists manage to scandalise and oust judges in another branch? THE Court of Appeals for the Federal Circuit (CAFC) is the basis/substance of Section 101 caselaw, which the USPTO follows. CAFC, in turn, adopts decisions other than its own, notably those of the Supreme Court, e.g. Alice and Oil States. As we shall show tomorrow, the USPTO is altering a few things in its guidelines, based on CAFC and the Supreme Court; it’s nothing radical, but patent maximalists do try to make it sounds profound and revolutionary. They hope to affect the outcome that way. The Federal Circuit Bar Association (FCBA) will be offering a webcast entitled “Last Party Standing: Who Has Standing to Appeal Administrative Decisions to the Federal Circuit?” on May 22, 2018 from 3:00 pm to 4:30 pm (EST). FCBA being FCBA, it will be speaking for patent maximalists rather than actual patent judges from CAFC. This is expected. We expect nothing else. In this age of Trump/Trumpism we’re seeing many attacks on judges (like their President). The latest attacks on CAFC — not just on PTAB — come from cowboy hats-donning self-acclaimed "inventors" (who used terms like “draining the swamp” in relation to USPTO Director Michelle Lee). They spewed this out at Watchtroll 5 days ago. So the site has just attacked CAFC (a high court) yet again. We’re sure that the judges at CAFC will be very impressed. This only further alienates them. 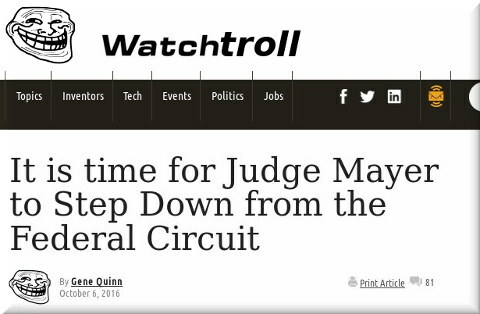 Watchtroll habitually calls for firing or resignation of judges (CAFC judges included) if they 'dare' say something that patent maximalists do not wish to hear. It’s mob mentality. Theodore Chiacchio does the same (4 days ago), albeit more politely. Writing about the decisions of CAFC is OK, but bashing the decisions, the courts and even individual judges is not honourable. It’s not illegal, but it’s disrespectful and it paints these attorneys/pundits as people who disregard the law except when a decision suits them. So putting aside these nasty attacks, let’s look at what CAFC actually did do. We don’t wish to feed/entertain insults or words about them. In Gilead Sciences, Inc. v. Merck & Co. Inc., Nos. 16-2302, 16-2615 (Fed. Cir. Apr. 25, 2018), the CAFC affirmed the district court’s finding that misconduct attributable to Merck barred it from asserting two patents against Gilead under the unclean hands doctrine. This appeal arose from an action relating to treatments for Hepatitis C, and more particularly Gilead’s treatments Solvadi® and Harvoni®, which use the compound sofosbuvir. Further discussion of the decision can be found on Finnegan’s Federal Circuit IP Blog. Algorithms are abstract as per Section 101 and should thus be unworthy of patents; any patents on these (even if they call the said database/s “blockchain” or whatever) ought to be voided by the court. In this particular case CAFC seems to be even tougher than PTAB. It makes it quite interesting. The tension between the cases in this situation is actually fairly small, but the setup raises an interesting question in my mind. When two decisions are released simultaneously, how should we treat the precedential value of the cases relative to one another? My initial answer is that the cases should be treated as we would a plurality Supreme Court decision. Veering away from the simultaneous release — would it matter if one were uploaded to PACER (the Docket) a few hours before the other? Under Federal Rules of Appellate Procedure R. 36, “a judgment is entered when it is noted on the docket.” The rules do not, particularly define priority of precedent, and I have not seen any Federal Circuit precedent on-point. Supreme Court becomes precedent immediately upon release. Federal Circuit decisions should seemingly have the same result by Default.